When putting together an architecture website, there are a few things you need to pay attention to. For instance, an eye-catching layout is a must. But, it shouldn’t get in the way of the designs being featured. So, a portfolio layout is helpful with plenty of whitespace, too. 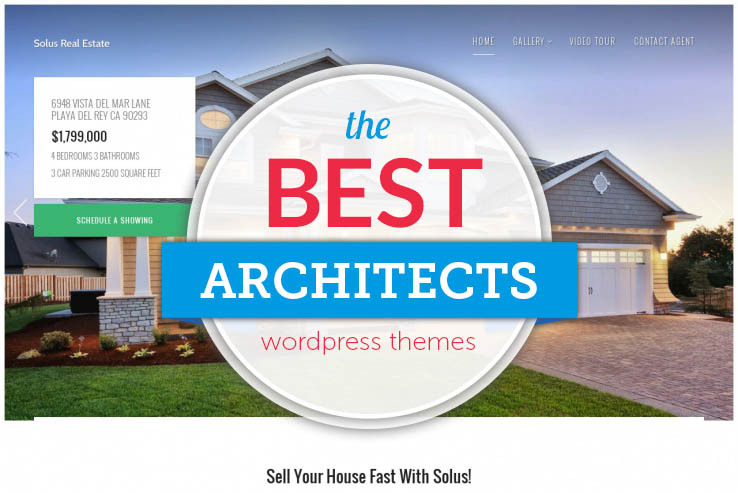 Creating this look from scratch can be daunting, so WordPress themes for architects are a solid choice. Before we get to our featured themes list, let’s first talk a bit about the theme selection process and what you should be looking for. An architect requires a little extra in terms of a WordPress theme. They need themes that show creativity, while also displaying professionalism. Contact pages and portfolio sections are essential, and the functionality for sharing drafts and designs is a must. Since architects are tasked with building their own small businesses, and primarily running them on their own. WordPress themes are marvelous ways to cut the costs while still maintaining a beautiful presence online. However, not all WordPress themes are created the same, since some of them are thrown together to look professional, but they don’t have the power that an architect deserves. For example, one theme may look great for showing off photos, but not all of them keep your high-resolution images proportionate once you buy the theme and upload the photos. This is a problem, so it’s time to take a look at the best options currently available. Keep reading to see a collection of themes that have the design elements and tools for running your architecture business effectively. Architekt is a stylish business WordPress theme suitable for architects and interior design studios. It can be easily adapted for an interior design company, consultancy agency or even a web design studio. 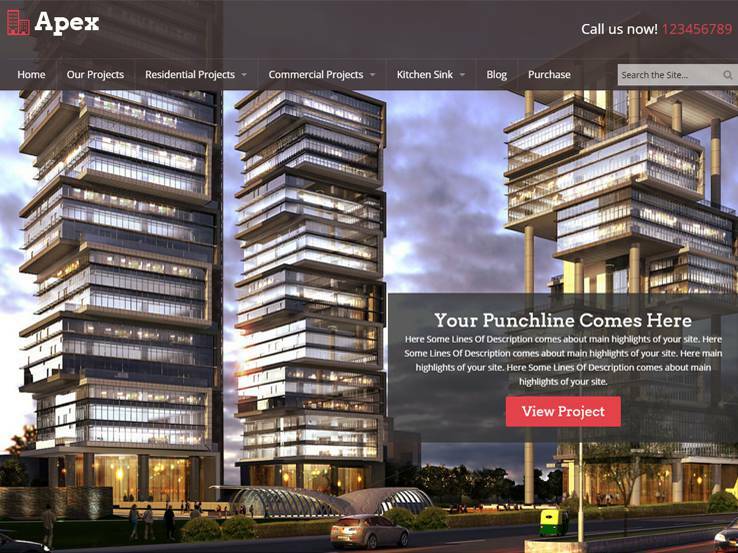 Architekt is very versatile and full of features template. You can change colors, backgrounds and much more directly from the WordPress admin, in a matter of clicks. 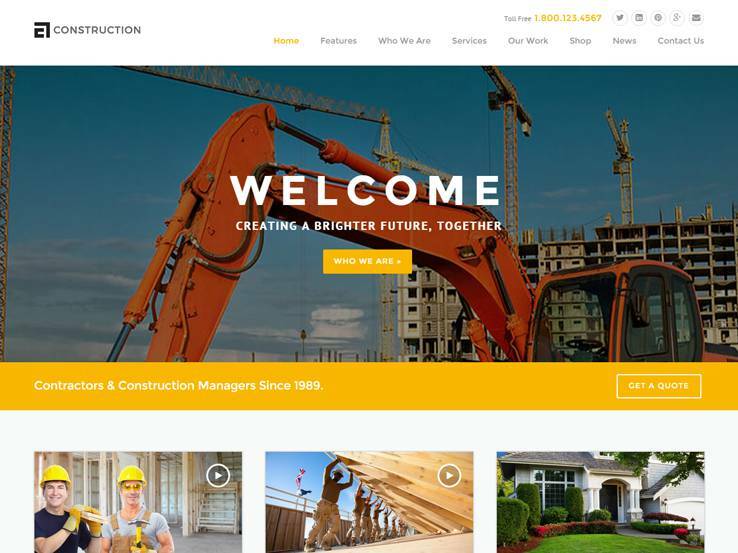 Starting off the list of our favorites is the Apex Construction WordPress theme, which is a beautiful and responsive theme for any architect or construction company. The theme has a unique function to help you organize your past work with a Property post type. This is similar to a portfolio, except it focuses primarily on companies that work with properties. What’s cool is that you can showcase the properties with maps, videos and even a brochure. The homepage is pretty stunning, and you can modify the layout with a simple drag-and-drop editor. This means that you never have to touch the code to make your site look professional. The widgets are truly what make this theme great since you can implement areas to show off your authors, contact details, and more. Generate a Contact Us page for your clients, and let your visitors subscribe to a newsletter right on the homepage. You can also share testimonials from past clients and include a property slider of your latest work. 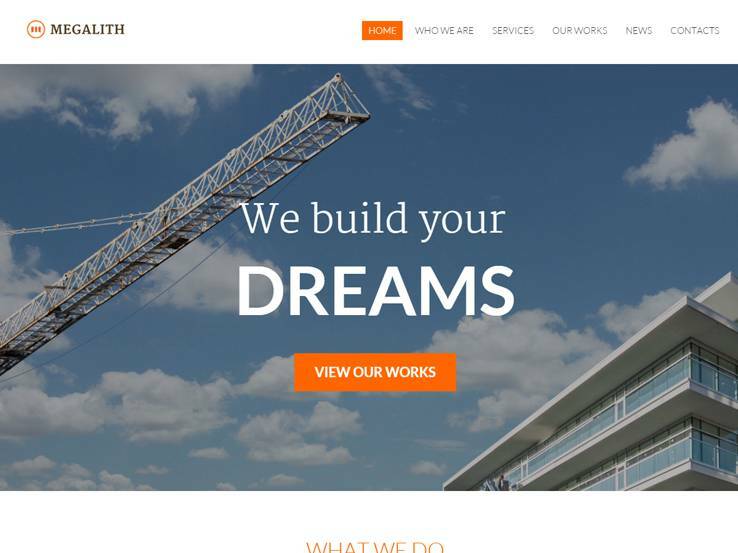 The Construction-WP WordPress theme is tailor-made for construction and architecture businesses considering it comes with various header and homepage examples to get you started in the right direction. The one-click demo importer is ideal for those who don’t want to begin the design process from scratch and the free visual page builder makes it easy to customize the layout without having to know the code. Show off your latest work with the Slider Revolution plugin which is included for free when you purchase the theme. The theme is completely responsive so you can rest assured your work will look great even on mobile devices. It’s also worth mentioning that the theme options panel includes over 600 Google Fonts and advanced theme options. The theme is also translation-ready. The Skywalker theme is completely responsive and looks great on any device. It provides a huge main page slider for showcasing some of your best buildings or other projects. The built-in shortcodes ensure that you don’t have to mess with any coding and the social media support helps you grow your social media followers. The theme includes Google Maps integration to display the physical location and directions to your office. Along with a Flickr gallery and an AJAX contact form, you can’t go wrong with using the Skywalker WordPress theme for your architecture business. 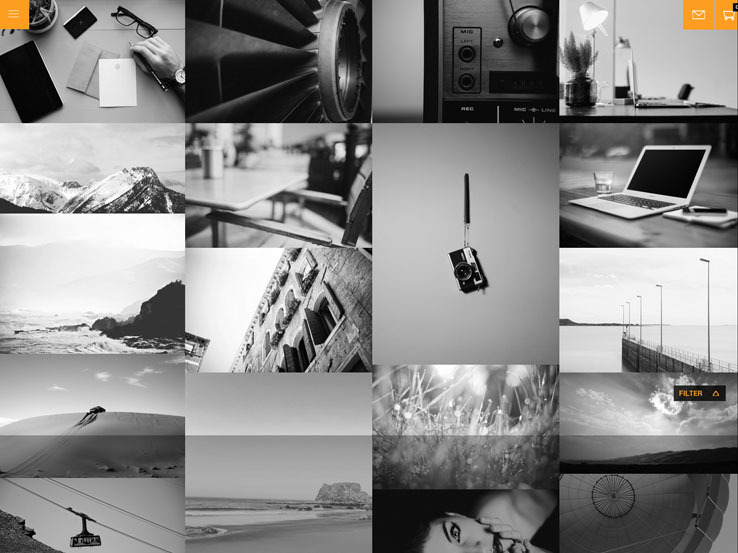 Matty is a powerful and easy-to-use theme with a full-screen image header for high-resolution photos. The main page has plenty of space to include all the relevant information while the elegant menu makes it easy to navigate your website. 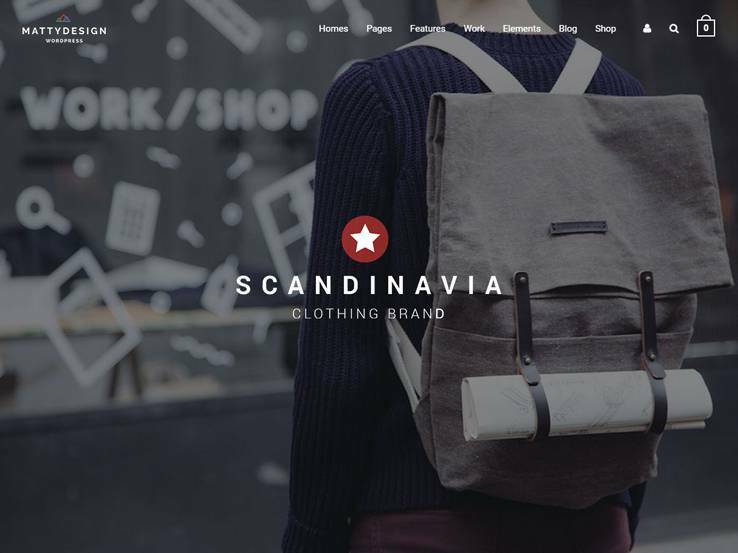 You can even sell your own products thanks to the integration with WooCommerce. Demo content is included with your purchase to speed up the setup process and the responsive layout ensures everyone can access your website on mobile devices. Matty includes Visual Composer plugin which lets you drag and drop elements instead of coding them yourself. Feature your latest projects and use the grid-based gallery area for showcasing your portfolio. Use the counters to display how many past customers you have had or how many projects you have worked on. The testimonial module is ideal building social proof and the Clients page allows you to show which clients you’ve worked with previously. 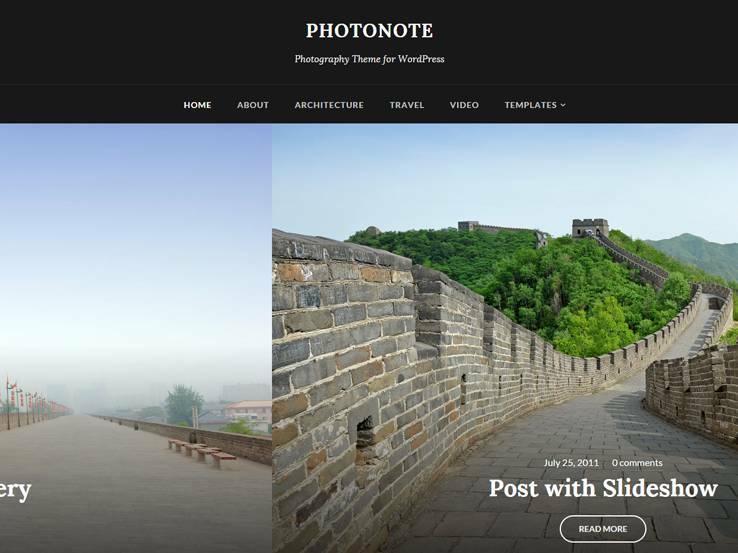 The Photonote theme is primarily built for photographers, but don’t let that scare you away, because this gem is a true powerhouse in the media realm. It includes a touch-enabled slideshow which allows potential clients to scroll through pictures of your projects, and Visual Composer is included so you can easily modify the layout. Quickly embed YouTube and Vimeo videos for video testimonials, showcases or even commercials. The grid-based portfolio area has everything an architect needs for presenting past work and you can even implement several widgets throughout your site to share recent posts, social media buttons, and more. Keep in mind that blogging is a key part of gaining exposure for your architecture business and this theme has all the blogging tools you need. If you’re looking for a theme that grabs the user attention, Uberto is the one to go with since it provides a stunning header with overlaying buttons that allow you to direct people to visit your sales page. Multiple color schemes allow you to choose the one that best matches your brand and custom widgets allow you to add social media buttons, Flickr galleries, and more. The About Me widget is a great way to introduce yourself to potential clients. Uberto is a perfect theme for anyone that wants a clean and simple design that puts the content into main focus. 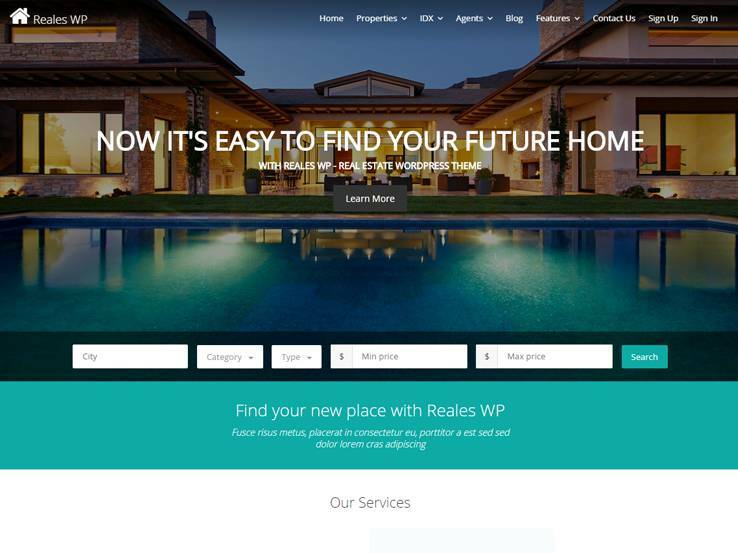 The Reales theme is built for real estate companies, but this is actually where it has an advantage for architects. Since most of the features cater to people who are working with properties, architects can use those exact same tools to share past work and even display current projects that they are working on. The theme has a modern and responsive design which is an essential feature in today’s day and age. It comes with Google Maps integration which allows you to easily show directions to your office. The front end property submission tool is an interesting way for architects to accept suggestions from workers or clients and the advanced properties filter is the ideal way to display a solid portfolio of your architectural work. The theme also includes shortcodes for adding elements like testimonials, columns, featured team members, properties, services, and more. People can log in with Facebook and Google on the frontend and they can even add property favorites to their profiles. The Megalith theme stands out from other architecture themes since it provides free access to premium plugins like Slider Revolution and Visual Composer. The one-click data importer allows you to easily import your content into your website and responsive design ensures your website will look great on any device. You can choose between a full-width layout or a boxed layout, depending on what you want your website to look like. Add a description of your company, display your services, and showcase a portfolio of your past works. The wide header has overlaying text and buttons for the ideal call to action towards your contact page. There is even a Request a Quote button to put potential clients in touch with you in seconds. Along with a testimonials area and a place to show off your past clients, the Megalith theme is a nice option for any architect. 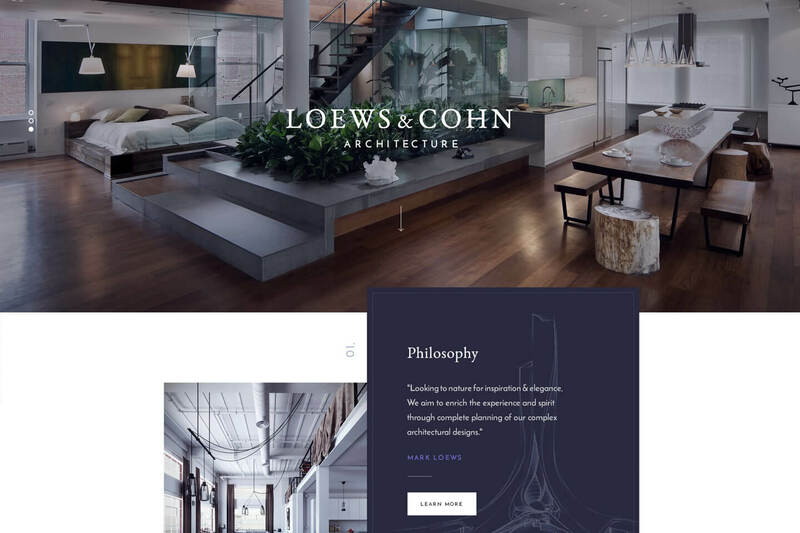 The Factum theme provides all the functionality and style that most architects need to show off their work and connect with clients. 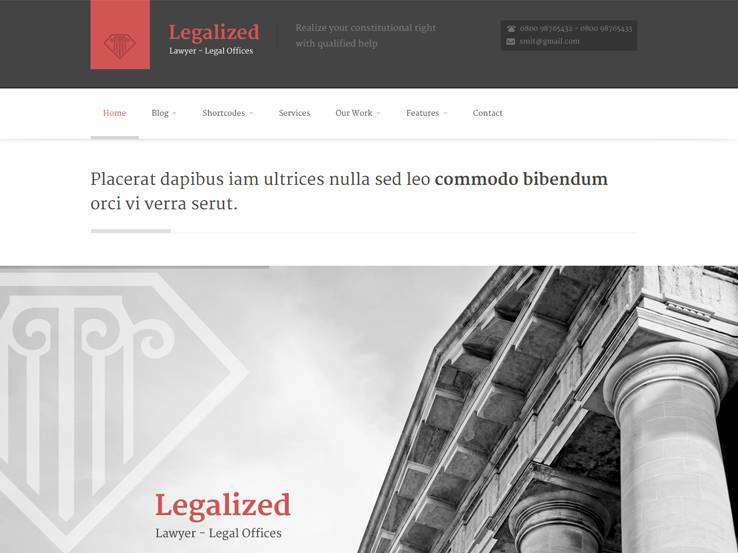 The theme is particularly designed for lawyers and law firms, but it works just as well for architects and their own companies. Factum offers a beautiful, yet professional, header area to include a photo and a brief description followed by a button that can be used as a call to action that encourages people to contact you or to check out your portfolio. You can highlight biographies for all the people in your company and display different services you offer. You can also highlight your past clients by including their logos on the homepage. The homepage has several content modules, each of which is easy to play around with and modify. The testimonial module is a great way to build social proof and share testimonials from past clients. Another notable feature is the contact area which has a sleek contact form that includes a Google Map so potential clients can easily get in touch with you or even find your office. 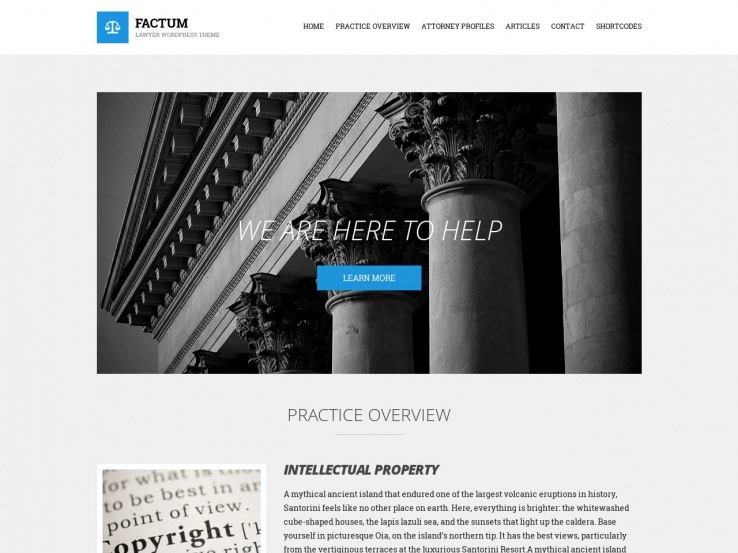 Finally, a full blog is included with the Factum theme, which allows you to share industry news with your audience and boost your search engine rank at the same time. 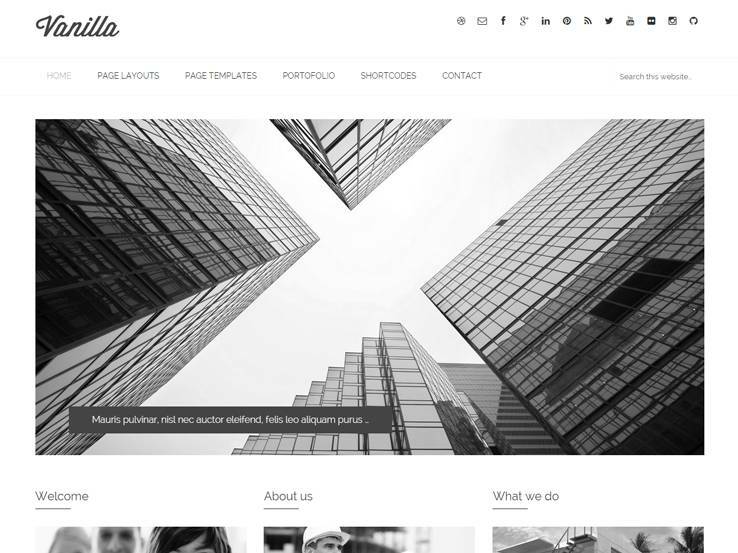 The Vanilla WordPress theme offers a super clean design if you’d like to place most of the focus on your content and minimize the distractions. This is a mobile-ready theme which ensures your website will look great even on smaller devices such as tablets and phones. Vanilla includes localization support which is an essential feature if you plan on reaching an international audience. Several social media buttons help you grow your social media following. The shortcodes mean that you can create anything from pricing tables to buttons, without knowing or implementing any code. The rather large header area is a great place to include a call to action and the filterable portfolio works wonders for letting potential clients find relevant work. Featured posts from your blog can be featured in thumbnail version on your homepage and the footer has plenty of space to include several widgets for recent posts, Flickr, and a tag cloud. Along with several page layouts and templates, a search bar, and a contact page for people to get in touch with you, the Vanilla theme is certainly a theme to keep your eye on. Megalithe comes from the folks at ZigZagPress, so you know it’s going to be a clean and modern take on an architecture design. The beautiful portfolio layout has a responsive design. Additionally, the Megalithe theme has localization tools needed to translate your website. Social media buttons match the theme perfectly and allow you to connect with your audience on Facebook, Twitter, and more. Add call-to-action and buttons with shortcodes which means you don’t have to touch a single line of code. The slider allows you to display high-resolution photos of your projects and you can include a text overlay for a brief description of the project or even your company. The portfolio has a filtering function so potential clients can easily find projects that are similar to their needs. Highlight your services with text boxes and icons and share your recent blog posts in a widget on the homepage. The blog looks great and it allows you to share content with your audience, boost your SEO, and establish yourself as the expert in your field. Choose from seven predefined color skins to incorporate your own branding and include additional content in the footer with different widgets. Use the Flickr widget to share photos of their past work or include contact information or recent post lists. The contact page is easy to customize and the portfolio has settings for a wide range of row counts. Simply put, Megalithe has all the tools you need to create a stunning online presence. 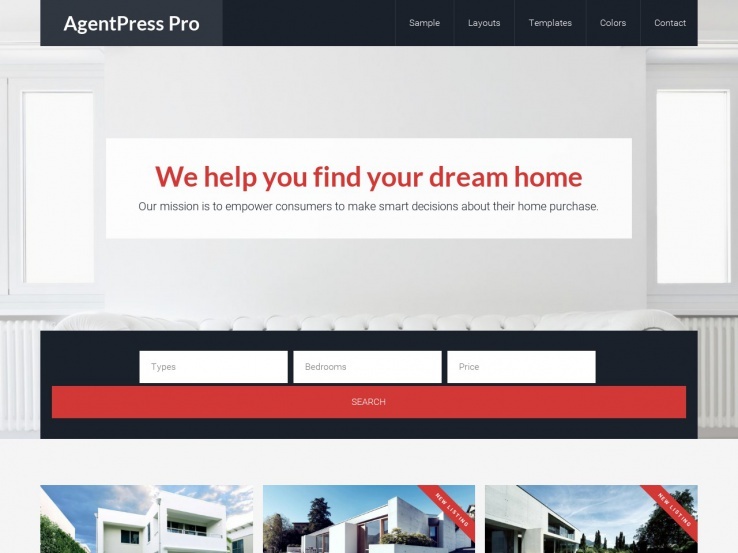 The AgentPress WordPress theme comes from StudioPress which means it’s a child theme for the Genesis Framework. This solid framework is known for its reliability and customization options, along with the ability to change child themes without losing any content. 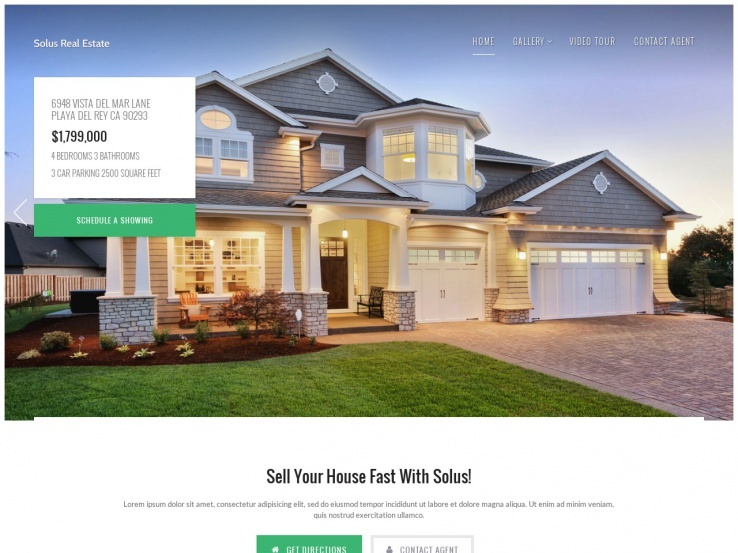 The theme is mainly for real estate agents, but can be used for a different niche as well. The responsive layout looks great no matter the screen size and it has beautiful theme options on the backend which allow you to easily customize the theme to your needs. The AgentPress Listings plugin incorporates some interesting features for agents considering you can manage your own listings and create custom taxonomies for the ultimate organization. The theme customizer allows you to modify fonts and color with ease. The AgentPress theme includes six widget areas, and each of them supports widgets such as the email signup form, social media links, recent posts, and more. The header supports text-based and image logos. Adjust the custom background and use the custom menus to make it easy to navigate your website. Use the theme to create a portfolio of your past work or include projects you are currently working on. Overall, the theme has quality support for photos and allows you to create an elegant online presence. Solus is yet another property showcase theme and this one has an interesting angle considering it’s meant to focus on an individual property. Demo content is included with the theme allowing you to launch your site quickly. It even includes interesting stock photos and icons that you can use to add extra visual appeal to your website. The theme has responsive and retina ready design which means it will look great not only on mobile devices but on high-resolution screens as well. Your website colors can easily be customized with the color picker and the translation options are essential for reaching out to an international audience. The theme includes several other unique visual aspects. The entire header takes up the majority of the screen allowing you to add a stunning high-resolution image and you can even incorporate buttons and a text overlay as a call to action. 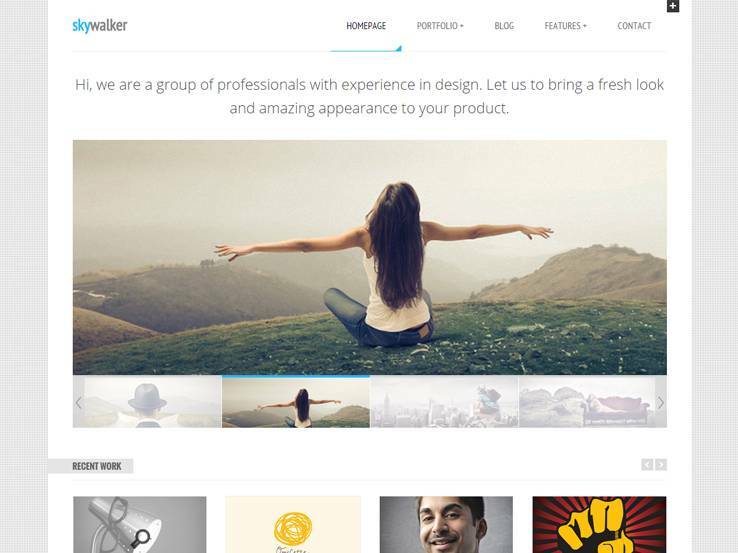 The header also functions as a slider for showcasing a wide range of properties or past projects. Columns and icons allow you to organize and highlight your content. Display information about the interior and exterior of a home or simply present your services. Use one of the sections to embed a map of your physical location. Social media buttons are included with the theme eliminating the need to install a third-party plugin. Along with a clean design, simple tools for connecting with clients, and a fast-loading template, the Solus WordPress theme is an impressive choice. Legalized has its main focus set on the law industry, but that doesn’t mean you can’t use it for an architecture business. The theme has plenty of features and customization options as well as an easy to use homepage builder that make it possible to adapt the theme to any industry. The theme comes packed with several page templates and it includes unlimited colors and a shortcode generator for easy designing. Google Maps integrates perfectly with the theme and a Contact Form makes it easy for potential clients to contact you. 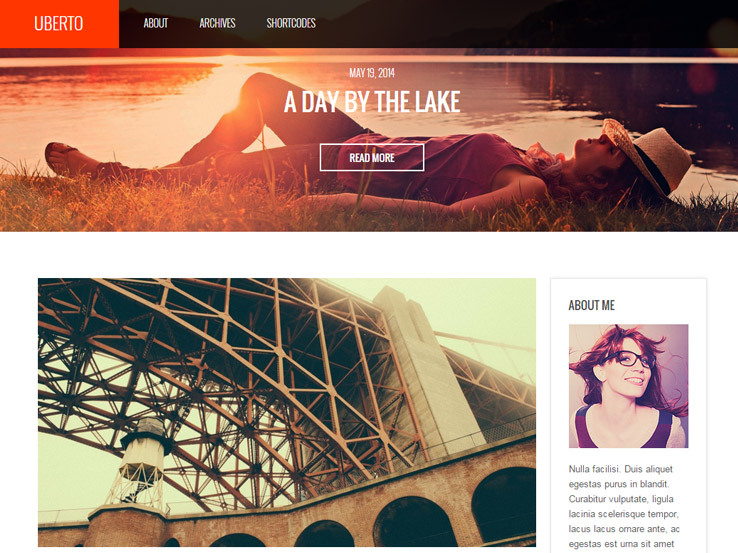 The Photex WordPress theme is a stunning theme that lets your past project take center stage. The theme is completely responsive for people who are trying to view your content on the go, while the entire homepage is covered with thumbnail images of your past work. When someone scrolls over a certain thumbnail, fun animations show a brief description while clicking on the image takes the visitor to a detailed description of that particular project. Users can like certain items to show the most popular ones and they can even view even more of your work thanks to the related projects list at the bottom of each post. You can also include social media buttons for potential clients to share your images on social media. Turn your website into an online store and sell your products with ease thanks to the integration with WooCommerce plugin. The animated contact form is a great way for potential clients to get in touch with you or request a quote for their project. The navigation bar is hidden to the left and it shows up only when someone clicks on it, freeing up space for other content. You can also translate your entire website to expand your reach. Implement a Google Maps module on your contact form, and use the shortcode generator to cut down on your design time. Along with custom widgets and Photoshop files, the design options are endless with Photex.